Interviews as a way to better familiarize the general public with not only our Faculty but also our Certified Providers. Check out the description of the first episode below, and I promise that not every episode will be this lengthy! PS. Make sure to check out the History of PRI - The Foundation of the Postural Restoration Institute (August 2008) written by Ron in 2008, to discover how far we've come over the past decade! "Welcome to the first episode of the Postural Restoration Podcast! In this Episode, I am joined by Founder and Director of the Postural Restoration Institute, Ron Hruska. The foundation of the Postural Restoration Institute resulted from many years of Clinical Practice and a strong interest in the patterns and positioning that at the time seemed to be the cause of many patients’ pain and dysfunction. Ron discusses his time in Graduate school pursuing a Master’s in Public Administration after receiving his Physical Therapy degree from the University Of Nebraska Medical Center. His time working at the V.A. Medical Hospital as well as his eventual role as Director of Physical Therapy at St. Elizabeth's Hospital in Lincoln, NE both played roles in his desire to look at and treat the human body through a multidisciplinary, systematic approach. This led Ron to create other ways of treating patterned dysfunction, initially through the use of the first “Re-Positioning” device called Protonics. Although Protonics looked and seemed to function to many in the orthopedic world as a Patello-Femoral “Brace”, it was actually much more. Using this device allowed him to "Re-Pattern” bi-lateral chains of muscle and look at orthopedics from a Femoral-Patella lens. Eventually this device left Ron with the desire to move into the private practice setting, in order to dedicate more time to roles with the APTA Association, and more time dedicated to learning and discovering further ways to develop his ideas. Protonics allowed him to connect with and teach other clinicians, including some of the first PRI Faculty members. Following the creation of the Hruska Clinic, Restorative Physical Therapy Services in 1999, Ron worked with fellow Physical Therapist Jason Masek and others to create some of the earliest PRI Non-Manual Techniques. I welcome you to join us on this journey as we continue to explore how the creation of this science has changed the way coaches and clinicians approach the treatment of the human body." Hands on Knees or Hands on Head Recovery Postures? Check out this new article! We were excited to see a newly published article this past week titled "Effects of Two Different Recovery Postures during High-Intensity Interval Training". This study was performed at Western Washington University, and includes PRC therapist Wren McLaughlin as one of the authors. While on faculty at Western Washington University, Wren was instrumental in sharing some PRI concepts with her colleagues and students. 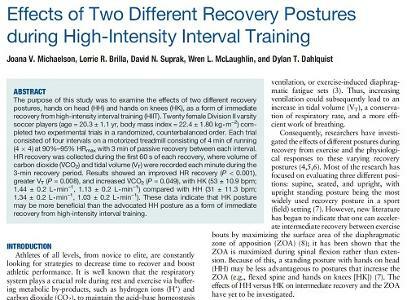 This study examined the effects of two different recovery postures, hands on head (HH) and hands on knees (HK) as a form of immediate recovery from high-intensity interval training. The researchers wanted to explore the effects of maximizing a diaphragmatic zone of apposition (ZOA) through a flexed spinal posture (hands on knees) rather than an extended posture (hands on head), during recovery breathing. The results of their study indicated that the hands on knee posture significantly improved HR recovery, tidal volume, and carbon dioxide elimination in comparison with the hands on head posture. Thank you Joana, Lorrie, David, Wren and Dylan for your work on this study, and for publishing these results for the world to see. You have provided such valuable data that will hopefully result in a new recovery position (and a deeper understanding of its benefits) for clinicians, coaches, athletic trainers, strength and conditioning coaches, personal trainers, and athletes around the world! 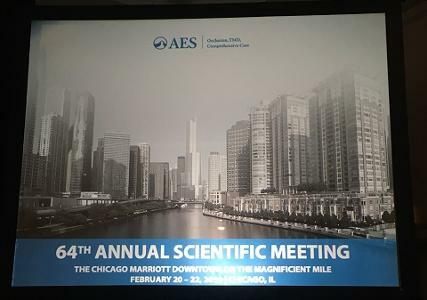 I spent my February 20th to the 22nd in Chicago at the American Equilibration Society. A long-standing congress that found me surrounded by about a thousand dentists. A convention that caused me to realize that I had come to the right place. Elizabeth Caughey DDS, with whom I work, implored me to come and...learn. Multiple topics were covered including: bruxism and sleep disordered breathing, occlusion and TMD, mentoring (a strong Ron Hruska point), pediatric airway orthodontics and I even heard a physical therapist speak of PT and TMD! Multiple topics moved my learning forward and caused me to repeat the phrase that I’ve said many times: my learning will never stop. I have no doubt that PRI will one-day be on the docket at this fantastic convention and until then I will continue to expand my learning. Thank you to Ron Hruska for compelling me to get out there and take courses “outside the box” of PRI. I am strengthened and I am excited. After much deliberation the new 2019 Hruska Clinic Shoe List is available for anyone who is interested in seeing how we look at shoes and how they can influence a PRI program. We feel footwear is an important factor for a lot of patients, especially those struggling to progress through an upright PRI program. Feel free to use the list as you would like, but please keep the name "Hruska Clinic" on the list. To get a copy of the list and to watch a video from Lori Thomsen, PT, PRC which describes a little about the history of the list, some tips for patients and for PRI practitioners, as well as some good information on several of the shoes that have changed on the list, check our website HERE. Feel free to contact us if you have any questions! A great weekend in Chicago at Pilates Central with Donna Byrne, PRC and her awesome team of Physical Therapists, Athletic Trainers, and Pilates/Yoga Instructors. Dan Houglum, PRC served as a capable lab assistant and the entire Pilates Central Team were warm and welcome hosts. Besides Donna and Dan, we were grateful to have 3 other PRCs in the course: Jesse Ham, PRC, Alex Maag, PRC and Jill Maida, PRC. Of the 32 people in attendance, 4 of them were first time attendees, and we had fun getting to know them. When you attend an Affiliate Course as your first PRI course, you are an instant VIP and we make sure you feel welcome and that you are not left behind on any of the new concepts. We checked in regularly with the first timers and we were able to stay on track for them throughout both days. In fact, as it turned out, these 4 VIPs ended up having some of the best questions and concept summaries of the entire group. Yes, I'm talking about you Candis. You made Rapid City, South Dakota proud (even though I know you are a transplant). Beyond tailoring the course to first timers, it was great to also expand on some interesting principles for those with more PRI experience. Always fun to keep it simple and also strengthen the experienced. The group was grateful for the simplified explanation of AIC patterned development, ZOA acquisition, lateralized frontal plane performance, integrated upright standing dynamics, and gait performance. The use of the PRI Integration for Geriatrics Tests in sidelying and sitting provided some great assessment options for the immobile, frail and chronic, while keeping our focus on gait deficits specific to each side of the body. The Positioning Techniques, the Group Exercise Techniques, the Functional Routines Handout and the appendix full of useful Geriatric exercises were a big hit. The functional bed, recliner, seated, transfer and standing sections in the appendix were a great resource for clinicians working with this type of patient. Besides there being 6 PRCs in the room throughout the weekend, there were many in attendance who had been to several PRI classes and had lots of experience using traditional PRI tests and techniques. One of my favorite things about the Affiliate Courses is that they provide a fresh approach and innovative ideas, even for seasoned PRI practitioners. I was reminded of this fact when I received the following message from a fellow PRI Faculty Member and PRC and good friend Jesse Ham: "James, clinically, I am loving the ability to achieve left laterality into the back seat with the posterior mediastinal feel/sensation in seated and being able to reposition a pelvis in hook-lying with alternating respiration. Thank you for adding layers of understanding to what I already knew and appreciated about PRI." You're welcome. Mandeville, Louisiana to be exact. I went down to Renew Physical Therapy to visit with some of the best folks on earth down in God’s country. Louisiana is a sportsman’s paradise and so many of the course attendees felt, to me, like kindred spirits. The class was Postural Respiration which truly is the flagship of PRI. This was the new and improved Respiration class and I stumbled a good bit as I worked my way through the rearranged PowerPoint and program. But I must say that Chris and Karlie McDougall DPT were such completely kind and forgiving hosts. They indulged my struggles and made me feel like one of the family. We had two students in our class from good-old Oday Lavergne’s clinic up in Alexandria; Phillip Wuellner and Erik Landstrom but they were not our youngest participants. The title of youngest participant goes to Chris and Karlie’s daughter Aubrey who was only 12 weeks old! Sometimes she cheered what was being said and others....well....she voiced her disapproval! I think she may have had a real problem with patterned, non-reciprocating, non-alternating diaphragmatic function. Because of that, I’m sure that she was in the right class. I did notice that she didn’t get a certificate of attendance. I’ll be speaking to Jen Platt about that oversight. Kyle Babin DPT, PRC was on hand to assist in our lab sessions and Kyle and I go pretty far back from his days in Texas. A kind and humble man, he truly provided clinical insight that was extremely helpful. I arrived a day early and spent a day in New Orleans touring the French Quarter and sampling the cuisine and sat in a wonderful throne at the Saint Hotel lobby. As PRI continues to grow and be a game changer for so many professionals, I find myself humbled and grateful to be chosen as a messenger. I am nowhere near worthy to be such, but will trust the wisdom of my mentor and friend, Ron Hruska as he continues to drive me to follow his mandate and be a mentor. Thanks to all of you at PRI and those of you in PRI Nation for your trust in me. I will do my absolute best to never let you down. And to the class participants: thanks for allowing me the opportunity to visit with you and share the exciting information of Postural Respiration! Every time I see, say or hear the word ‘airway’ I think ‘oscillation’, and every time I see, say or hear the word ‘oscillation’ I think ‘airway’. Therefore, you can probably imagine how excited I am for the upcoming Interdisciplinary Integration Symposium and for the opportunity to engage with all the speakers who have dedicated their professional lives to these two words. “In a throat, a note is forming. A puff of air, a pulse of the lungs, rushes up the windpipe and through the vocal cords, parting them like a pair of lips. As the cords begin to vibrate, they’re stretched taut by muscles to either side, raising the pitch. The diaphragm pumps more air, rocketing the note up the vocal tract, making its walls hum like the barrel of a woodwind. The sound ricochets back and forth as it rises, gaining resonance with each rebound, till it bursts into the hollow chamber of the mouth, the ringing cavities of the sinuses, and careens off the palate into the open air. Over the next few weeks, I will highlight each of our six orchestrated speakers and presenters, and how their ‘Approach to the Production of Voice, Airflow, and Resonance Frequency Breathing’ strengthens our sense of self and self-satisfaction. Postural satisfaction requires intimate integrated oscillation from our vocal cords, neck musculature, throat or airway and occiputs. Highlighting is something I do with every article, book or journal I read. I look forward to every one of our Spring Symposiums, but this year it will be hard to contain my excitement between now and one of the biggest highlights of my year. Coming from the Polar Vortex, it was a refreshing respite to be in sunny Arizona for the first Myokinematic Restoration course of 2019. 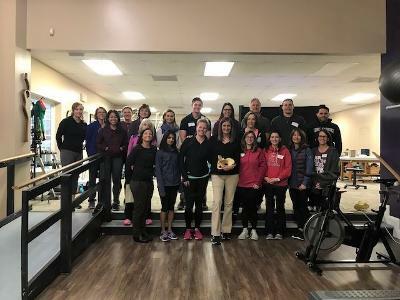 We were fortunate enough to have a very diverse class of attendees ranging from chiropractors, to strength coaches, to physical therapists working in various settings, to certified athletic trainers working with professional athletes. Myokinematic Restoration is a fantastic course to kick-start one's PRI journey. 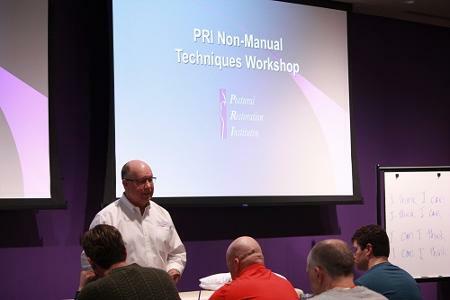 This was the rare introductory course where over half of the attendees had been to previous PRI courses. This provided us a unique opportunity to delve into other material that we wouldn't otherwise be able to cover. We had excellent questions and excellent lab time as a result. One of the topics that we were able to cover in this course that previous attendees appreciated was the Hruska Abduction Lift Test. This test is taught in depth in Pelvis Restoration as well, but for those who had attended Myokin previously, this was a new topic for them. Additionally, it provided the newcomers a chance to be able to appreciate how PRI integrates the gait cycle and breathing into treatment from beginning to end. We were also able to briefly touch on other topics, such as PEC management and rib cage IR, because of the previous experience of many of the attendees. However, we were also able to stay very on point and keep the course on track for those who were attending for the first time. My thanks to Jim Wittekind, PT, PRC, for his help during lab and insightful discussion. The staff from 360 Physical Therapy, Becky Fox, Jennifer Peters, Krystina Leal, Caleb Walls, and Jason Roe, were perfect hosts. My thanks to Nathan Whitney, Ginsie Huntley, Liz Cash, Chris Burke, and Garrett Chin for their questions and discussion. At the end of the day, we all need to be a little more like Bruce Wayne, and less like Batman. And we need to use our "good boy band" of muscles, instead of the "bad boy band" that the L AIC often puts us into. As a result of our conversation around normal mechanics vs. compensatory mechanics relative to the L AIC pattern, we were able to delve into how these analogies applied to our assessments and treatment approach. We were able to spend a lot of time on muscle activity as well as how to apply the Hruska Abduction and Adduction Lift tests into assessment and PRI non-manual activity selection. We were blessed with a great group of movement professionals, and I was fortunate to be able to help them either continue or start their PRI journey. Thanks for a great weekend! What a great way to start off teaching my first course of my 2019 schedule at my own clinic here in Southern Pines! Nothing like sleeping in your own bed and walking your dogs at lunch time! I had the help of Sarah Ratti PTA, PRC! Sarah was a member of the 2018 PRC class and I was lucky enough to get to know her in December and have her help during lab! I was so excited to teach Pelvis Restoration following attending Ron's Non-manual technique workshop last weekend in Lincoln, NE. I learned so much and it certainly help energize my teaching and deeper understanding of the Non-manual techniques! I was able to really help my course attendees with choosing techniques and following a frontal plane progress as it relates to the Pelvis. Every time I teach this course, I learn more and grow not only as a faculty member, but also as a clinician. I am hopeful my course attendees would feel the same. My class was interdisciplinary! We had PT's, PTAs, massage therapist, kinesiologist, strength and conditioning coaches, Yoga Instructors and massage therapists! It was a 50/50 split of newbies and experienced PRI clinicians. Maude and Brenda were my Pure Newbies, meaning they really didn't know what PRI was all about. But they left excited that they had been exposed to the science and couldn't wait to integrate what they learned into their current practice. I was happy to have Malynda Kerksick in my class. Malynda was a former patient of mine and now a PRI enthusiast! I have had the pleasure of watching her grow as a Yoga instructor and her questions were much appreciated. She also did a great job photographing moments throughout the weekend. She gets photo cred for capturing my pure joy while teaching this weekend. I am so proud to be a part of the growth of Postural Restoration. We get asked all the time which course should I take next? What is the best first course to take? I made sure to emphasize the true nature of feed-forward neurology. You treat a pelvis, you influence the thorax, neck, head and big toe! I hope to see these faces again in a future PRI course! The #PRINation is now stronger than ever before! A few days before this course, I was reviewing the material and made a remark to Jen Platt on how much “good” stuff is in this course, that I forget about from year to year. 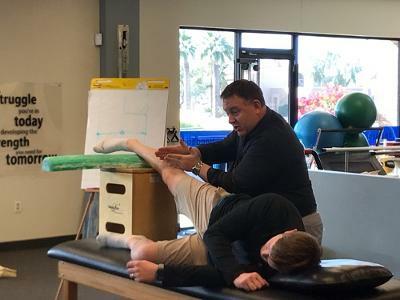 It is so enjoyable to have an opportunity to discuss the reasoning one might use before selecting a position to place a client or patient in, before selecting a non-manual technique. What went into the thought processing regarding reference centers and concepts and why is it important to select an appropriate primary reference for desirable “referent” behavioral outcomes? Results are based on preparation. Preparing the patient on what to be mindful of, sense, possibly expect, experience, etc. are all more important than making sure they are doing the technique “correctly”. Processing information can be difficult if individual centers of tactility are not explored first. Words matter, word placement matters, word meaning matters, word correlates matter, word integration matters and word synchrony matters. This course allows me to review this communication process, inhibitory intensity and neurologic effort for those who have unique limitations but very similar outcome needs, relating to pattern development around asymmetrical design. Over twenty different non-manual techniques, many of which were selected by the attendees, were reviewed, torn apart, discussed, re-designed and then re-designed again, to recognize reliability of approach and validity of use. It is personal for me. And therefore, an opportunity for those who share their transparencies to reap “good” stuff.